My darling Corina, proffered a snap decision. Not being one who shuffles around with conversation, I immediately rose to the occasion and said, ‘Yes, dear.’ What a good boy am I? Of course it was not difficult to accept this snap decision as all she said was, “Let’s go to our favourite spot for three days. We have a clear diary.’ What a change for us! I was instantly subjugated to the ‘office’ to make the online booking, and managed to fix the whole ‘shebang’ in minutes. Everything was fitting into place very nicely. I would have time to finish a small task before making a bee-line to Caloundra, and time to alert my brother Bill and his wife Val that we were ‘pending’ as one might say. In short, put another Shiraz in the cooler. 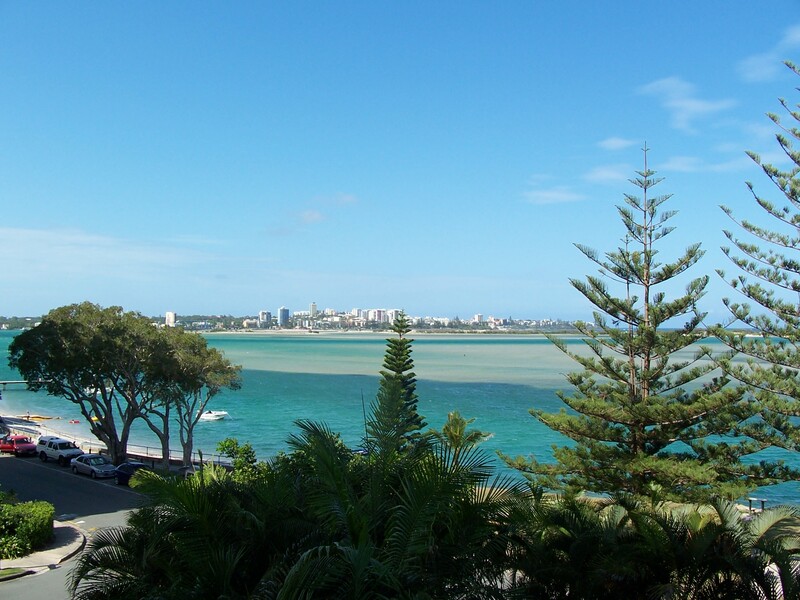 What is it about Caloundra that we like so much? Well may you enquire. For a start, Caloundra has a certain charm of its own, but we just adore Golden Beach resort and the tremendous views on offer all the year round. The apartment is amply suitable for the two of us with room to entertain two or twelve extras on occasions. Well, twelve did stretch it a little, but with finger food from the foyer restaurant and a glass of wine or two, a most pleasant time was spent with lovely people roaming in and out onto the balcony. What a view! I did offer to take Corina on a cruise while we were there, but when she saw the size of the kayaks for hire she thought I was being a trifle stingy. However, I know that she gets seasick in the bathtub, so I persisted, and finally she acquiesced. We trailed the boats into the waters of Pumicestone Passage on a beautiful sunny Queensland morning, with the estuary absolutely sparkling and beautiful. I know that if she is kept occupied with the paddling, she will neither have the time nor the inclination to even think about being squeamish. What better way to finish the day, than to relax after lunch with a short snooze, then dinner with a divine wine at the Thai cafe next door. Before we four dined, Bill and Val joined us on our balcony for a quiet ‘sauv blanc’ with their usual remark, ‘This place is heavenly,’ reminding us how fortunate we are to have such a beautiful resort so close to home. It’s our favourite, without question – but don’t tell too many others about it, will you? We don’t want it booked out when we want it. Sorry WorldMark. This entry was posted in (QLD) Sunshine Coast and tagged australia, caloundra, Golden Beach, holiday, queensland, vacation ownership, worldmark, Wyndham Resorts. Bookmark the permalink. We think Golden Beach Resort is pretty special too. The views to the Pumicestone Passage are stunning and always changing – from silvery, glass in the mornings, receding to sand bars and islands at times and then magically transforming back to blue seas before reflecting the beautiful sunset colours. The team there have always been lovely and the spa always HOT!!! We’ve been there several times but still haven’t managed to get to the BBQ area yet. WIll have to make a note to head back soon. We’ve been lucky visitors to this resort and love it as well. The pool is perfect for kids – sunny in the morning but shaded in the afternoon, so if they’ve had too much sun for one day/week, the pool’s a perfect spot to spend a few hours later in the day. Plus, there’s a pool slide. Looking forward to when we get to visit again. Why weren’t we invited? ?Sounds too goopd to be true.!! Will certainly put this down as our next place to stay when visiting Caloundra.